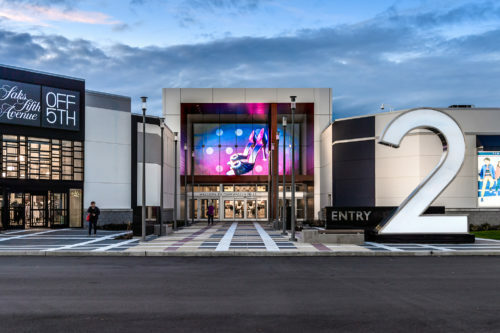 Currently playing a 12-minute video loop featuring fashion images to help enhance shoppers’ experiences at the Tsawwassen Mills retail development in Greater Vancouver, these light-emitting diode (LED) displays are installed at entrances 1 and 2, and can be seen from up to 99 m (325 ft) away. Photos © Craig Minielly/Aura Photographics. Photos courtesy Optec Displays Inc. Dating back thousands of years, the Tsawwassen people have lived continuously in south coastal British Columbia. With an identity deeply connected to its land base, approximately half the tribe’s 430 members live in that area, which comprises 724 ha (1790 acres). In 2009, the Tsawwassen People ratified the first urban First Nations Treaty in the province, culminating 14 years of negotiations. The treaty provided the tribe municipal, provincial, and federal types of jurisdiction over a land base. The shopping mall’s construction began in 2014, after two years of planning and site preparation. Leased by Ivanhoé Cambridge, the retail destination’s purpose is to generate revenue to advance more economic development for the band and to fund social programs, including the building of a community centre. The mall is expected to change the face of retail in the Lower Mainland. The $600-million complex, with 180 stores and an 1100-seat food court, boasts 111,480 m2 (1.2 million sf) of retail space. It has four traditional sit-down restaurants, a children’s play area, a sports dome, and six public entrances, each with its own special design features. Further, several stores offer unique entertainment options, including a skate park in West 49 and a themed bowling alley in Bass Pro Shops. 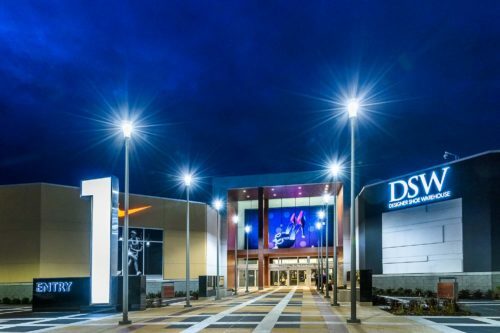 Tsawwassen Mills is fully enclosed, with five distinct shopping neighborhoods—Fashion, Outdoor Life, Coast Salish, City, and Nature—each featuring its own custom artwork and design elements. Coast Salish artwork, featuring contributions from members of the Tsawwassen First Nation (including Chief Bryce Williams), are also prevalent throughout the complex. To complement the scale of the site and address other challenges, Pattison Sign Group selected a proprietary light-emitting diode (LED) display. The 16-mm (5/8-in. ), 352×656 matrix panels measure 5.6 x 10.5 m (18 ½ x 34 ½ ft) unframed and 6 x 11.5 m (20 x 38 ft) framed, fastening together for easy installation. British Columbia-based NorthStar Signs mounted these displays with custom brackets at entrances 1 and 2 on the interior. Their size allows them to be seen from up to 100 m (325 ft) away through the glass curtain walls. The signs’ high-quality resolution, vivid colour, and excellent clarity make the videos and graphics easy to see regardless of time of day or weather conditions. For the Ivanhoé Cambridge/Tsawwassen First Nation project, the high-quality resolution, vivid colour, and excellent clarity make the videos and graphics easy to see regardless of time of day or weather conditions. Digital signage creates targeted and persuasive messages addressing what consumers are looking for in retail environments to influence purchase decisions. High-efficiency design also allows the screens to overcome the mall’s bright interior lighting conditions without pushing electrical components to their limits—saving energy, increasing reliability, and extending use. In the future, these signs will display mall and store information, as well as communication about events, exhibitions, and dining. (The displays are currently playing a 12-minute video loop featuring fashion images.) Today, when shopping malls provide a lot more experience than just shopping, large displays with compelling visuals become essential for customers’ involvement. Tsawwassen Mills is committed to corporate social responsibility and environmental sustainability. The project is pre-certified under the Leadership in Energy and Environmental Design for Core and Shell (LEED CS) program. The shopping mall aims to use less energy, emit fewer greenhouse gases (GHGs), preserve more natural resources, and reduce more waste than traditional projects. It also includes electric vehicle charging stations and employs building materials containing recycled components. Outside air is provided from air-handlers serving the main corridors and food court area of the building. Energy-efficient packaged rooftop units offer air-conditioning to all retail spaces, and energy recovery units are used for the public washrooms’ exhaust systems. The energy consumption on all systems is measured using submeters and monitored with a building automated system (BAS). Due to the high-efficiency systems, this project is eligible for the Fortis BC Incentive Program. All washrooms are equipped with low-flow plumbing fixtures with electronic flushometers, complete with a hydropower self-generating system. Control-flow roof drains collect stormwater, and five grease interceptors are installed in the sanitary system for food court and restaurant areas. High-efficiency domestic water heaters are employed for showers, service mop sinks, and lavatories. For more on the signage aspects of this project, click here.